China’s ‘Freeze for Freeze’ Plan for North Korea Gets Chilly Reception in U.S. THE U.S. GOVERNMENT IS not considering any changes to ongoing military exercises it conducts on and around the Korean Peninsula with its allies. U.S. Ambassador to the U.N. Nikki Haley dismissed as “insulting” the proposal that Beijing has touted for months and repeated at an emergency Security Council meeting Monday, held in response to another nuclear test that North Korea claims involved an advanced hydrogen bomb. A State Department spokesman confirmed Tuesday there is no intent to cancel or otherwise change military exercises. Other officials have defended the exercises despite North Korean claims that they are provocative and dangerous. The Israeli foreign ministry report also says that the Trump administration backtracked on many of the demands it had said it would make in the run-up to the meeting with Kim. The report also noted that Trump’s decision to halt joint military exercises between the U.S. and South Korea while denuclearization, a proposal known as “freeze to freeze,” was a significant reversal of Washington’s previous position. China had proposed this option last year and was completely rebuffed by the Trump administration. The assessment appears to be in line with that of many North Korea experts, who say that the agreement between the Trump administration and the regime of Kim Jong Un contained very few concrete plans of action. Experts also noted that the two regimes likely have very different ideas about what denuclearization means. “Chairman Kim has told me that North Korea is already destroying a major missile engine testing site,” Trump said in the wake of the summit in Singapore on June 12, without detailing which site Kim had pledged to dismantle. But an analysis by monitoring group 38 North revealed that there is still no evidence that North Korea is destroying anything. “38 North has conducted a survey of the North Korea’s rocket and missile launch and engine test facilities using recent high-resolution satellite imagery and has not yet identified any activity associated with the dismantlement of facilities at Sohae or any other test sites in North Korea,” the report said. “The U.S. has only agreed to suspend (the tests) once before, in 1992. That was enough to get North Korea to agree to denuclearization at that time, though it became apparent that the nation’s actions didn’t match its words. “We get along very well, we have a good chemistry,” Trump told Steve Doocy of “Fox & Friends.” “I agreed to meet. Of course, I agreed. You’ve got to agree to meet. If you don’t agree to meet, you’re gonna have nuclear war,” Trump said. The U.S. canceled the tests once before, in order to encourage North Korea to negotiate, and after the negotiations, North Korea developed atomic weapons and ballistic missiles. 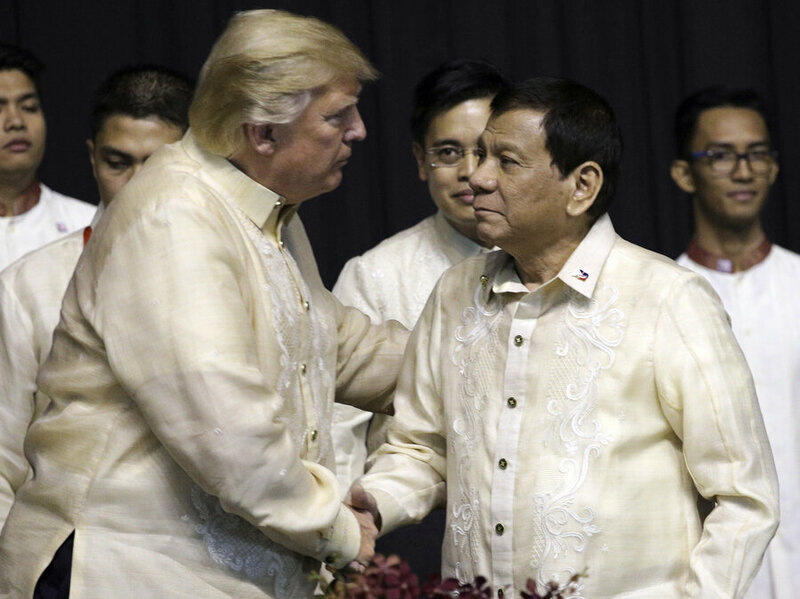 Trump does have a plan: It is to have a “great relationship” with the murderous dictators of the world, whom he greatly admires. Do you feel safer, now? 5 Responses to Who says Trump doesn’t have a plan? The summit between President Donald Trump and Kim Jong-un wound up in a victory of style and image over real substance. Clearly Trump wanted to return to Washington claiming a foreign policy victory in a display that drew 5,000 journalists, including the superstars of television news, to this island city-state. The fact was, however, that the final joint statement omitted any mention of complete, verifiable, irreversible denuclearization. Kim obviously would not have signed any statement that used that term while determined to cling to his nuclear program. Despite all the assurances and promises, however, the uncertainties were obvious. In fact, he and Kim had reached no definite agreement on anything. That was clear when he said, “Sanctions will remain in effect,” meaning North Korea would have to show evidence of having begun to denuclearize. In the end, he said, it would take perhaps 15 years for North Korea to have cleared away its entire program. Kim, of course, is not likely to live up to any of his promises while clinging to the North’s nuclear complex at Yongbyon, 60 miles north of Pyongyang, where a plutonium reactor has provided what’s needed to produce 40-60 warheads. North Korea also has nuclear facilities and storage areas in caves and tunnels around the country. Just as unresolved as the sanction issue is that of the 28,500 American troops in the country, many now headquartered at Camp Humphreys in Pyongtaek, 40 miles southwest of Seoul, as the U.S. moves out of the Yongsan base in Seoul and pulls back from Camp Casey at Dongdaechan. That announcement shocked both American and South Korean military people who value joint exercises as an opportunity to test their skills and get used to coordinating with each other. It was clear Trump was likely to clash with Jim Mattis, the secretary of defense, while yielding to pressure from North Korea, which objects strongly every time American and South Korean troops engage in joint exercises. Most recently North Korea protested “Max Thunder,” a joint U.S.-South Korean exercise last month featuring warplanes from both countries. Kim Jong Un, before taking off aboard an Air China plane in the evening, avoided any comment beside the pleasantries that he had exchanged with Trump when they met in the Capella Hotel on secluded Sentosa Island, off the main Singapore island, but he had triumphed by making certain the document that he signed with Trump did not go beyond generalities. He did, however, agree on one point that Trump had wanted — that American search teams could look for the bodies of about 6,000 U.S. troops still listed as missing in action from the Korean War. Trump said that relatives of the missing had often approached him asking what he might do to revive the searches for the remains. Over the years American search teams have visited North Korea in search of remains, but the North Koreans have objected to search requests tensions rose. Throughout his remarks Trump gave the impression the process of denuclearization of the North would move at almost lightning speed. Kim, he said, might even begin “as soon as he arrives” back in Pyongyang. “We have to get things moving fast,” he said, blaming his predecessors in the White House for failing to resolve the problem. Trump is an incompetent and a liar. There are those who know it (the 60%), and there are those who deny the obvious (the 40%). Note how the last quote is one that, as always, blames Obama for . . . whatever. Blaming Obama (or Hillary) appeals to Trump’s low IQ followers, who cheer while having no idea what they are cheering about.